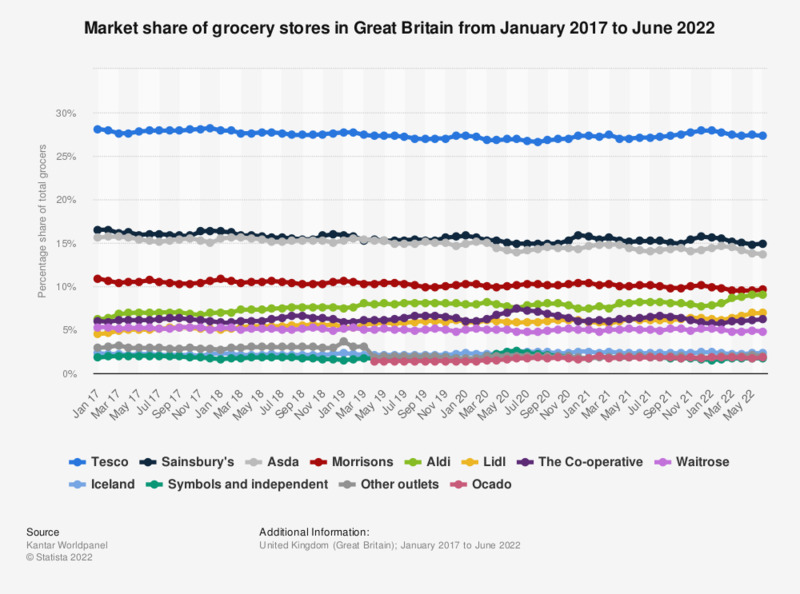 This statistic illustrates the market share of grocers in Great Britain (GB) monthly from January 2015 to March 2019. Tesco and Sainsbury's had the largest share over the period under consideration, holding 43.4 percent of the market together as of February 2019. In March 2019 Asda's share surpassed Sainsbury's. Prior to the popularity of the discounters, the grocery retail market was dominated by the 'big four' supermarkets: Tesco, Sainsbury's, Asda and Morrisons. On the back of the post-Brexit uncertainty and growing inflation, however, consumer behavior has shifted in favor of cheaper alternatives such as Aldi and Lidl.The resulting 'price wars' has led to supermarkets lowering their prices. Crucially, this has caused increased volatility in the grocery retail market and, as of January 2017, Aldi overtook the Co-operative to become the fifth largest supermarket in the United Kingdom. 12 weeks to 1 February 2015. 12 weeks to 26 April 2015. 12 weeks to May 24, 2015. 12 weeks to June 21, 2015. 12 weeks to July 19, 2015. 12 weeks to August 18, 2015. 12 weeks to September 13, 2015. 12 weeks to November 8, 2015. 12 weeks to December 6, 2015. 12 weeks to January 3, 2016. 12 weeks to January 31, 2016. 12 weeks to February 28, 2016. 12 weeks to March 27, 2016. 12 weeks to April 24, 2016. 12 weeks to May 22, 2016. 12 weeks to June 19, 2016. 12 weeks to July 17, 2016. 12 weeks to August 14, 2016. 12 weeks to September 11, 2016. 12 weeks to October 9, 2016. 12 weeks to November 6, 2016. 12 weeks to December 4, 2016. 12 weeks to January 29, 2017. 12 weeks to February 26, 2017. 12 weeks to March 26, 2017. 12 weeks to April 23, 2017. 12 weeks to May 21, 2017. 12 weeks to June 18, 2017. 12 weeks to July 16, 2017. 12 weeks to August 13, 2017. 12 weeks to September 10, 2017. 12 weeks to October 8, 2017. 12 weeks to December 3, 2017. 12 weeks to January 28, 2018. 12 weeks to February 25, 2018. 12 weeks to March 25, 2018. 12 weeks to April 22, 2018. 12 weeks to May 20, 2018. 12 weeks to June 17, 2018. 12 weeks to July 15, 2018. 12 weeks to August 12, 2018. 12 weeks to September 9, 2018. 12 weeks to October 7, 2018. Market share data is based on all expenditure through main store tills, excludes petrol and instore concessions.